It is always good to look back at history as it gives you a sense of perspective as to where you have come from so do you ever wonder how the Swans have faired on this day in history? Well read on to find out exactly what happened, wherever and whenever the Swans played on 9th December. 2 years ago on 9 December 2013 – Former Swans striker Danny Graham scored his first goal in 30 games (the last one came for the Swans against Chelsea in Janaury 2013!) which earned Hull City a point at the Liberty Stadium in the Premier League. A 2nd half goal from Chico Flores was enough to see Michael Laudrup’s Swans move up to 10th place in the table and send the 19,303 home relatively happy, especially after a poor first half display. 7 years ago on 9 December 2008 – The Swans came from 2 goals down to draw 2-2 with Barnsley at the Liberty Stadium in the Coca-Cola Football League Championship in front of a 11,442 crowd. 9 years ago on 9 December 2006 – A Carl Dickinson own goal gave the Swans a fortunate point at Bloomfield Road, as they held Blackpool to a 1-1 draw in Coca-Cola Football League One. The point saw Kenny Jackett’s Swans drop to 7th place in the league table. 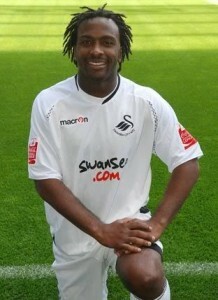 20 years ago on 9 December 1995 – Steve Mardenborough made his debut for the Swans as they were thrashed 5-1 at the Manor Ground by Oxford United in Endsleigh Insurance League Division Two. Steve Torpey grabbed a consolation goal for Bobby Smith’s side as they dropped to 21st place in the table. 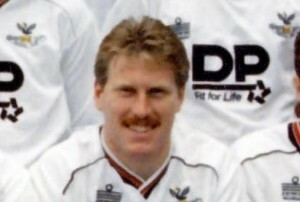 26 years ago on 9 December 1989 – A Paul Raynor penalty and brace from Paul Chalmers were enough for the Swans to secure a place in the 3rd Round of the FA Cup after a 3-1 win over Peterborough United at the Vetch Field. Little did the 4,175 crowd at the time know that the Swans would draw Liverpool at home in the next round! 29 years ago on 9 December 1986 – The Swans romped to an impressive 3 nil win over Walsall at the Vetch Field in the Freight Rover Trophy Preliminary Round. The 2,909 crowd saw Terry Yorath’s Swans put their higher division opponents to the sword, thanks to goals from Ian Love, Gary Emmanuel and Colin Pascoe. Did you see or remember any of these games – if you did then leave a comment below with your memories.